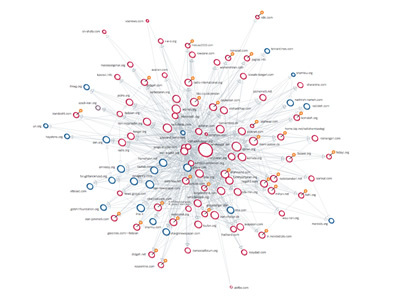 The Govcom.org Foundation, an Amsterdam-based foundation dedicated to creating and hosting political tools on the Web, and its collaborators have developed a software tool that locates and visualizes networks on the Web. The Issue Crawler, at http://issuecrawler.net, is used by NGOs and other researchers to answer questions about specific networks and effective networking more generally. 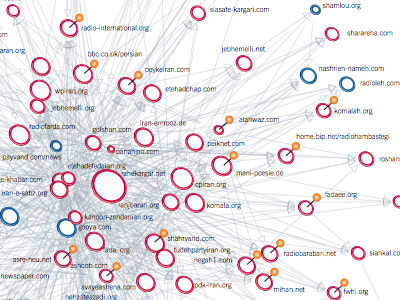 In this case, Issue Crawler was used to map Internet censorship in Iran. On March 30, 2006, the authors crawled a series of URLs from the OpenNet Initiative's list of Iranian social, political and religious sites. They found a network of sites through one iteration of co-link analysis and fetched each site through a proxy in Iran (on 18 May 2006). While doing this, the team discovered sites previously unknown to be blocked and compared newly discovered blocked sites with an entire list of Iranian websites checked by the OpenNet Initiative. The finding is the discovery of 30 additional blocked sites in Iran. Hey, Admin(s).. Just wanted to say that - although I love this site.. but please, could you put a "PDF" label next to cloaked urls, that contain PDF.. just for the sake of convenience.. ..nonetheless, I'll keep coming back anyways ;o thanks..